Cardiac output is the quantity of blood that is pumped out of the heart in a minute. It is calculated by the heart rate (beats per minute) multiplied by the stroke volume (amount of blood pushed out of the heart upon contraction). In certain diseases, the heart may be affected and this may reduce cardiac output. The heart will try its utmost to maintain a normal cardiac output (compensatory mechanisms) but after time it is unable to do so. Cardiac output is ultimately reduced and this state is an indication of heart failure. The heart is a muscular pump. At rest (diastole), blood from the body or lungs fills into the atria (singular ~ atrium). 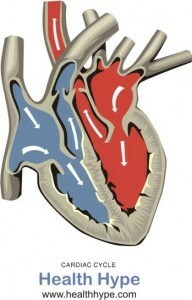 When the heart contracts (systole), the blood is pushed out of the ventricles and sent out to the lungs and body. This process (cardiac cycle) is carefully coordinated to ensure that the heart can work at its peak without unnecessary strain on the heart muscle. There are a number of factors to consider in cardiac output. Stroke volume is the amount of blood pushed out of the heart upon contraction. End-diastolic volume is the amount of blood that fills in the heart after relaxation and just before the next contraction. End-diastolic pressure (preload) is the pressure present before a contraction. It indicates the extent of cardiac muscle stretching and determines the force at which the blood can be pushed out during contraction. Myocardial contractility is the the ability of the heart muscle to push out blood upon contraction. It is essentially the strength of the heart muscle to produce force. Systolic aortic pressure is the pressure of the blood that is pushed out of the heart which will be at its greatest immediately after the blood leaves the heart and enters the aorta. Stroke volume and systolic aortic pressure is a combination of end-diastolic volume, end-diastolic pressure and myocardial contractility. If any of the above factors are affected or impaired, the cardiac output can be reduced. This means that the sufficient blood will not be circulated throughout the body at a pressure that will maintain a healthy circulation and perfusion. The aorta is elastic and will stretch as high pressure blood leaves the heart. The recoil of the aorta will then play a further role is keeping the blood flowing at the correct pressure – this prevents excessively high pressure of blood leaving the heart and maintains a sufficient pressure to return blood to the heart. This is known as the “Windkessel Effect”. This law states that in a healthy heart with normal cardiac output, the amount of blood that is pumped out of the heart (stroke volume) should return in full (end diastolic volume). The greater the volume of blood that leaves the heart, the greater the volume that will return and vice versa. If less blood returns that what was pushed out, then the cardiac output will decrease. This is an important concept to understand in order to identify the type of heart failure and identify the cause of reduced cardiac output.